My daughter and I spent 24 hours at Taste of Camp early last week. Our camp offers week-long sessions throughout the summer for kids who have completed 1st grade through high school. My son and our niece will get to spend a week there in about a month. My daughter is just out of kindergarten – so she is able to spend one day there with a parent. The kids and parents learn about and experience camp with the hope, of course, that the kids will be so excited they will come back in a year and spend the whole week! I was excited – I wrote about the eager anticipation last week! I felt inclined to apologize for writing about camp so much. But I concluded it just further supports my claim that camp changes lives! This ministry is important in my family’s faith life – so I will write about it often! I’m not sure what I expected during our short stay. I knew we would have fun; I was certain my daughter would fall in love with camp! Within the first hour of our arrival she is introducing herself to others, making bracelets for the other kids, telling me the best part about camp is her new friends. We walk as a group outside. Other kids hold hands with their parents. My daughter runs up ahead to walk and talk with the counselor. I walk alone, 15 feet behind her, and soak it in. I felt maybe the tiniest bit of sadness – my little girl doesn’t need me! But to be honest, this is not surprising behavior from my independent 6-year-old. That first night continued – dinner, hayrack ride, songs and games. For the most part, I was an observer. It took everything I had not to pull out my phone every 10 minutes to snap a picture! I knew I needed to just experience. She was there, ingrained in camp life. If she comes back next year (and each year after that), this is what the experience could look like! There will be no pictures to capture it. It felt like a gift that I could see it first-hand! Plus, no picture can truly capture the joy on her sweaty, smiling face as she ran across an open field on a beautiful summer evening. 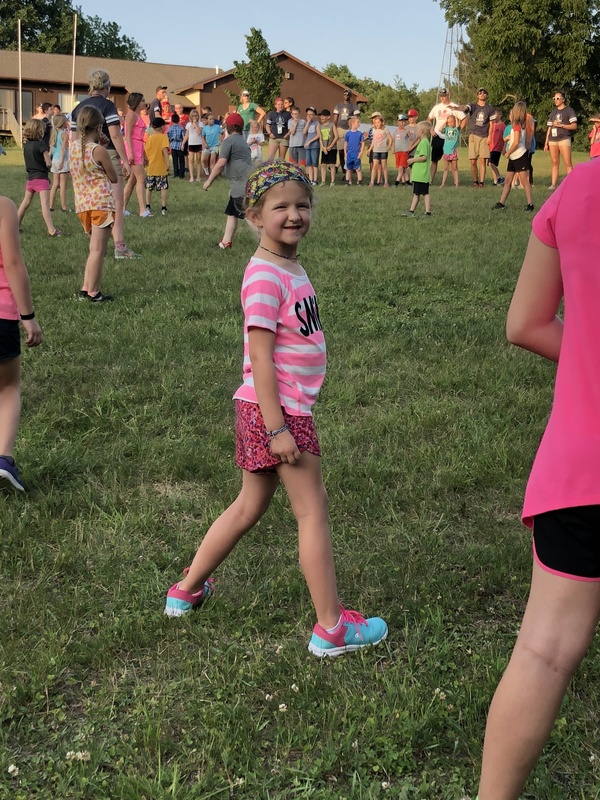 For many families, Taste of Camp is the opportunity for the kids to learn about and get excited for their own time at camp. It was something different for me. I was able to pause, and then simply watch my daughter in action: making friends, having fun, singing songs, praying, building relationship. Through just a glimpse, I was reminded of the power of camping ministry; intentional faith formation through fellowship and fun! We spent one night there, and we were able to participate in one evening worship with other campers on a hill-side at dusk. My daughter sat with a friend, and I was left on my own. I sat and soaked in the words of scripture. I watched the wind blow through the same trees I had stood before 20 years ago. I sang the same quiet worship songs I had helped lead for children who are now adults. For a moment I was transported to a time when camp was my whole world; when faith was central. Categories: Ministry | Tags: camp, children, community, faith, prayer, summer, trust | Permalink.